Decorate your child's room with the stunning, vintage styled Kico Yumbo Aeroplane for a bright and colourful room light that emits a soft glow. 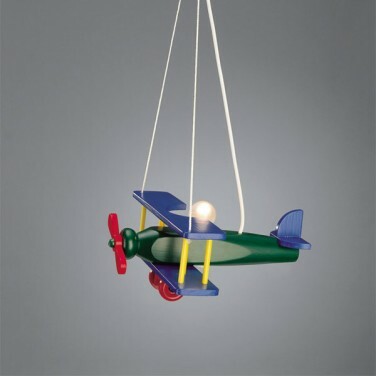 A bright and cheery wooden aeroplane light fitting, the Yumbo Aeroplane Pendant really brightens up kid's rooms. The aeroplane is a colourful vintage wooden toy design and the bulb sits in the cockpit so that it looks like a little illuminated pilot. Very Cute. Made from synthetic and wood bamboo and reed.